Never team up with in-laws. In those days, a person could be jailed for a business partner’s personal debts. Julius’ erstwhile partner, and brother in law, Christopher Webber Fenton owed money to lots of people. 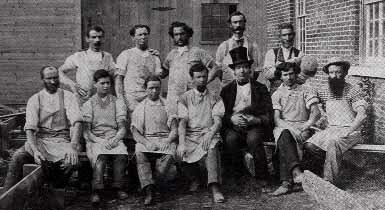 Julius inherited a successful stoneware business from his father Luman Norton in 1840. Julius was slowly growing the business when Christopher married his sister and burst on the scene in 1845. Christopher was a scion of another talented pottery family. His father, Jonathan Fenton, had even written a poem to him as a child about their “pedigree,” prodding him to aim high. Grow the business you say? Why not take over the world! Porcelain! Agate ware! Parian sculptures! Rockingham! Yellow ware! Anything Staffordshire does we can do better! For a time, Christopher’s fertile imagination paid off. Bennington became “the Staffordshire of America.” The frantic pace during their brief three year collaboration (1845-47) must have been something to witness. But ideas – and bills – piled up. To keep it rolling, Julius put in overtime on marketing. Like his ill fated New York City trip. In the end, Julius was still a Norton. Respectability and stability mattered. The arrest was the last straw. But others came before. For example, Julius’ employees were solid neighborhood fellows. Christopher brought in all sorts of characters to realize his dreams. Some, like the Englishman Daniel Greatbatch, were amazing. But many were rabble rousers, often prone to drunken reverie. 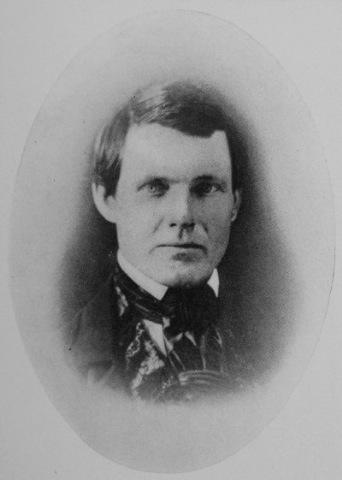 One, Alexander Stephens, ended up as Vice President of the Confederate States of America. After the partnership ended Julius kept some ideas and abandoned others. 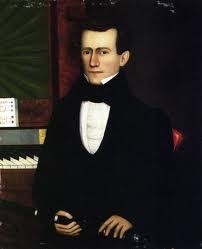 He died in 1861. Christopher continued hatching schemes across the country. He died in 1865. But whatever their differences while alive, they’re both equal now. The Potters and Potteries of Bennington. John Spargo. Cracker Barrel Press/Southampton NY. 1926. One reason; it’s a technical tour-de-force. This pitcher was essentially made out of scratch. With a few notable but limited exceptions, we had no ceramic supply companies in 1840. Henderson and his contemporaries were tenacious geniuses. Liverpool had previously flooded the US with similar wares. Many here tried to duplicate them. Henderson, himself a cast-off of the English pottery world, claimed first success – initiating America’s mass-produced pottery era. Others contested his claims. But they were all operating at roughly the same time; they were all on the cutting edge of what was possible in American ceramics in the early decades of the 19th century. Another reason for my reaction; the pitcher’s iconography. The imagery relates to William Henry Harrison’s 1840 presidential bid. A log cabin, a slogan “The Ohio Farmer,” Harrison, and an eagle. Previous candidates lobbied party bosses in smoke filled rooms, public speeches being uncouth. Harrison didn’t just “speechify.” He hurdled insults at incumbent Martin Van Buren (“Marty Van Ruin”). He re-invented his own background (“born in a log cabin”). He coined slogans (“The Ohio Farmer”). He milked alliances with big business (whiskey magnate E.C. Booze bankrolled his campaign and popularized a drinking term). He pioneered the “whistle stop” train tour and plastered his face on newly available locally made transfer print ware. Harrison won, then died of pneumonia a month after giving his inaugural speech in a blizzard. The blue-blood Harrison probably never saw the inside of a log cabin. He was an “Ohio Farmer” with thousands of acres, all managed by underlings. In short, he was a multi millionaire posing as a good ol’ boy you’d want to have a hard cider with and vote for (they don’t all come from Texas). Boisterous public self promotion, total self re-imaging, slander, spin, collusion – the inception of the modern presidential campaign. …A Victorian frivolity? More like a 500 pound gorilla. Ceramics in America, 2002. Robert Hunter, Ed. Chipstone Press/Hanover and London. 2002. Only the first few generations of Nortons were actual potters, though. Captain John Norton, his son Luman, and Luman’s son Julius. Most of the rest were content being local Brahmins, sitting atop the wealth created by their pottery making progenitors. Except Edward, who tried to revive the then flagging pottery in the late 1880’s. But he died young. From then till today, the Norton name became affixed to their refractories and abrasives businesses. Anyway, John Spargo was a Marxist agitator turned pottery collector (really). He wrote several books early in the 20th century about American ceramics. His “The Potters and Potteries of Bennington” is a landmark text. It’s also a hagiography. A paean to the Norton family. The book is peppered with glowing accounts of the Nortons by their friends and neighbors. The Nortons were gregarious, true enough. They regularly strolled through the pottery, top hat in hand, chatting with the workers. Luman Norton was, according to Spargo, well liked and well respected. How ironic, then, that the arsonist wasn’t a British agent or an interloper from any number of rival potteries. It was one of the trusted boys guarding his barn. There must be a story here. The Potters and Potteries of Bennington. John Spargo. Cracker Barrel Press/Southampton, NY. 1926.